The original focus of EFT was to eliminate negative emotions, which is a very worthwhile goal. Since then many people have been working on using EFT to amplify positive feelings to improve their lives. In this EFT Cafe, Andy Hunt will demonstrate a simple and effective process to go from having a negative point of view towards an event or task to having a positive and resourceful state of mind. These kinds of things can feel bad. Perhaps we avoid them or work our way through them gritting our teeth and waiting for them to end. It is possible to think and feel differently about these situations and how we respond to them. We can become much more positive and resourceful and graceful in how we accomplish what we have to do. This three step EFT process will help you move from all those negative feelings to feeling positive, resourceful and much more capable of doing what needs to be done. This EFT Cafe will be on Wednesday 9th October, in the Teaching Centre at St Oswald’s Hospice, Newcastle upon Tyne from 7pm to 9pm and costs just £10. 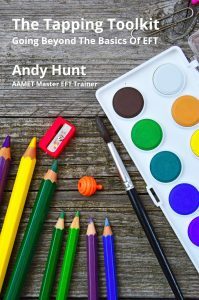 Andy Hunt of Practical Wellbeing LLP is an Accredited AAMET EFT Master Trainer. The Tapping Toolkit is a practical collection of strategies and tactics for people who use EFT/Tapping for their own personal development or in their professional work with clients. 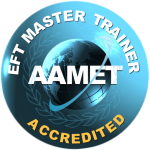 The AAMET EFT Level 1 is the foundation level EFT training and equips you with the skills to use EFT to work on your own issues and those of your family and friends. This training is fully self-contained and open to all, enabling you to use EFT confidently for a variety of issues. Go to the EFT Level 1 Training page to find out more.